One of the 3 goals of our business model is to mentor young engineers. As part of that we ask our graduating interns to write testimonial letters documenting the results of their experiences. Most are rather brief. Sometimes they never appear at all. Today we received a letter from an intern who graduated a year ago. It was music to our ears because we clearly achieved our goals with this young woman. To students looking to be interns, Engineering is generally thought of as one of the most applicable majors. Graduating seniors can apply for jobs right out of school without additional schooling, but few know what a product development engineer really does day to day. I found this out through interning with Bob and Kerry at Springboard. They have a system set up that allows interns to understand what actually working as an engineer feels like. I’m talking about activities like communicating with clients, testing prototypes, constructing robust SolidWorks models, working with local manufacturers, and even smaller activities such as contacting vendors for quotes. They are fantastic guides and they allowed me the freedom to take on a project and experiment and make recommendations on how the project should move forward. I’ve talked about my experiences in every interview I’ve had, and used most of the skills I picked up already in my job now. One of the greatest benefits to working at Springboard was that I could go in anytime that I could. I worked during the semester, and often could only go in after hours. During the summer I worked for them, I was able to take a class. This probably would not have been possible at another internship, and with a double major this meant I did not have to overload my schedule during the year. Finally, Bob and Kerry are great to work with. They value every opinion and the depth of knowledge about product development is incredible. I learned so much when I was just sitting in the office and never felt like I was in their way and could always ask questions. To improve the experience, I would recommend possibly having interns work together more. I think this would increase progress on projects. I’ve found at my job now it helps me to talk through portions of projects with my coworkers and make sure that I am moving in the best direction. Otherwise, I would highly recommend this to any student, especially those looking to go into consumer product development, as it gives valuable work experience in a flexible environment. Here at Springboard Engineering Solutions, we now have the ability to print composite parts with CONTINUOUS fiber reinforcement strands for higher strength applications! 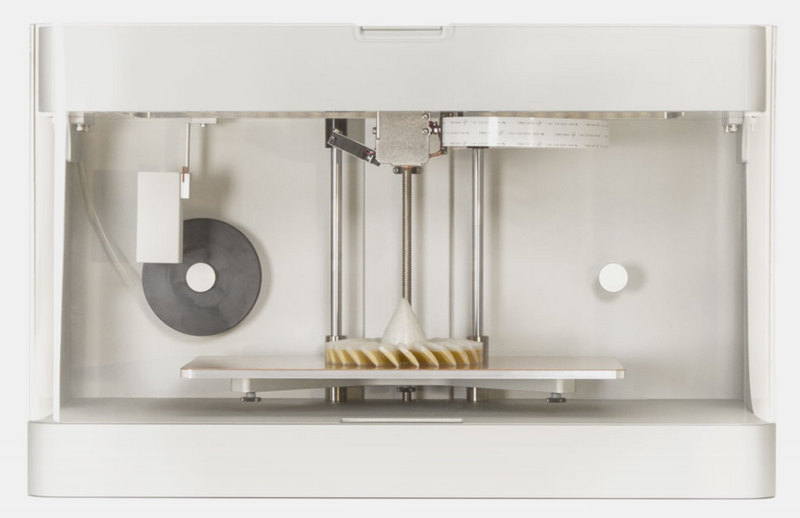 With the acquisition of the recently released Mark One composite printer by MarkForged, we have jumped into the market of reinforced printed objects. Printing with continuous Fiberglass, Kevlar, and even Carbon Fiber has allowed us to dramatically increase the capabilities of our printed parts. Since the Mark One has a layer height of 0.1 mm it is also capable of printing precision parts in pure Nylon without fiber reinforcements. The printer software allows for the s to control the density of fiber layering as well as the density of the nylon, offering full control over the weight to strength ratio of the product. 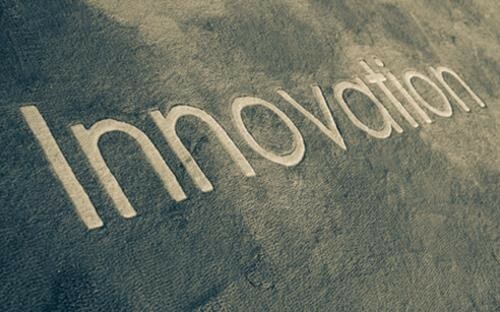 While this new printer technology is not without its limitations we have been very pleased with its performance. This we sold our first commercial parts off of the printer! 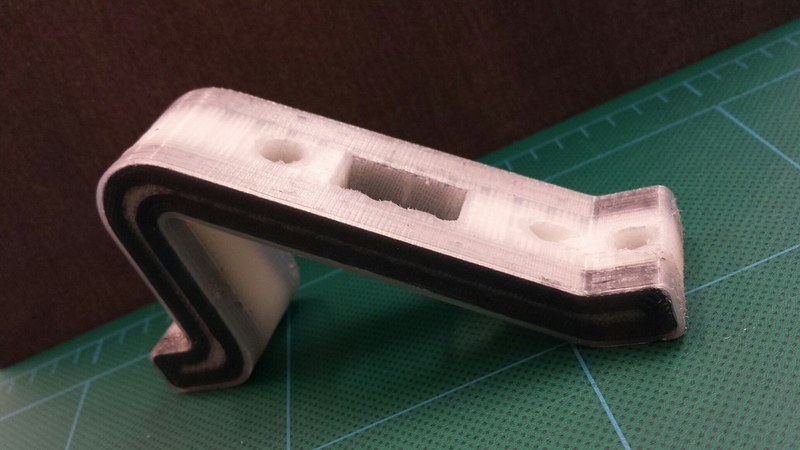 We developed and printed a high strength custom angled bracket for an inventor. This bracket is filled with carbon fiber on the ends for greater strength properties. The carbon fiber allows the part to be rigid, strong, and lightweight, weighing only35 grams, but with sufficient strength that we cannot flex it by hand. 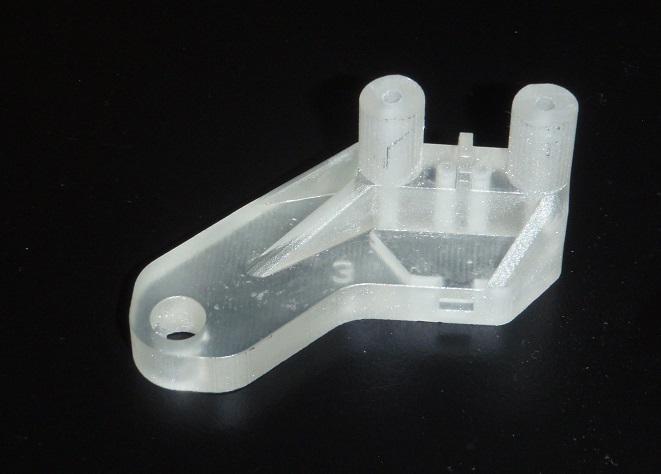 This part also demonstrates the 3D printing ability to implement complex holes into a print with holes running at three different angles for different purposes. One of the holes is even square. Our Mark One is now through its prove out phase and we are ready to accept orders to print on it. This is in addition to our other existing printers as well as our service of sending out to our partners to insure that we print your part with the best possible process and material at the best possible price. 3D printing has been making a lot of news recently. To listen to the news, we are only a few short years from being able to “print” anything. Just like Star Trek…. And it is a bold new frontier in every sense. Without a doubt, all forms of 3D printing are revolutionizing the world of design as well as the world of manufacturing. Printing prototypes that both look pretty and help us to understand complex shapes has become old hat. Now we can make functioning parts that go into working assemblies. In some cases, we are printing final product in nylon, stainless steel or even titanium.